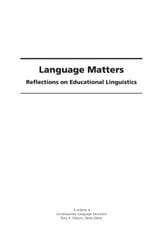 "This book addresses a timely and very important topic: language in education. Language, apparently, is a very tricky business. On the one hand, everyone uses language, and virtually everyone has strong views about language. In the educational domain this seems to be especially true. 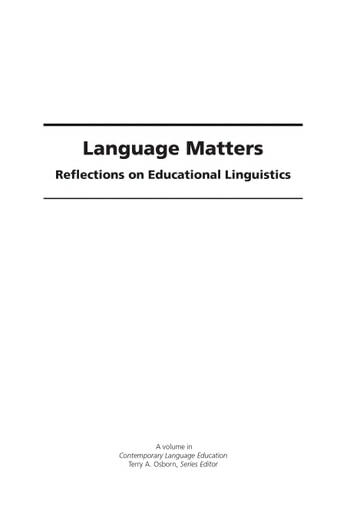 Language is not merely an intrinsic component of the educational process as the medium of instruction in the classroom, but also serves as the mediator of social reality for students and teachers alike. It plays a central role in articulating and conveying not only social, cultural and empirical ideas, but ideological concepts as well. It is also used to make judgments about the speaker, not to mention its role in maintaining differential power relations. And yet, in spite of this, the role of language is not sufficiently recognized in classroom practice much of the time. Nor is language, except in fairly narrow ways, really an especially central part of the curriculum, in spite of its incredible importance. To be sure, we do spend a great deal of time and money attempting to teach students to read and write (that is, to provide them with basic literacy skills), and we provide nominal support for foreign language education programs. We also provide limited support for children coming to school who do not speak English. What we do not do, though, is to recognize the absolute centrality of language knowledge and language use for the educated person. This book seeks to address these issues from the broad perspective of critical pedagogy.